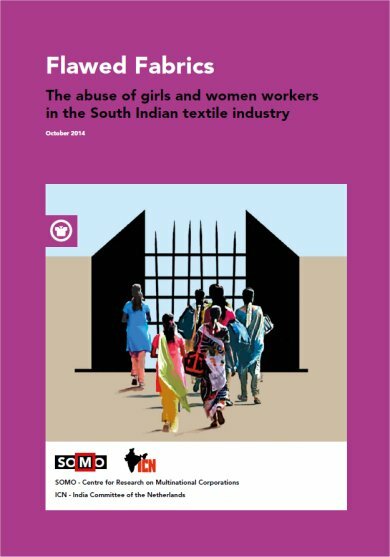 This report highlights serious labour rights and human rights violations faced by girls and young women employed in the Tamil Nadu spinning industry in South India, which is a major hub in the global knitwear sector, supplying some of the big name clothing brands – including C&A, HanesBrands, Mothercare and Primark. In fact, Tamil Nadu is home to some 1,600 mills, with a workforce of more than 400,000 workers. Sixty per cent of the total labour force consists of girls and young women. Through a mixture of desk research and interviews on the ground with workers employed at five Tamil Nadu spinning mills, this joint report by the Centre for Research on Multinational Corporations (SOMO) and the India Committee of the Netherlands (ICN) concludes that several core labour rights are being violated. Girls and young women are being lured from their home villages by false promises and are working under appalling conditions amounting to forced labour. The current report is part of a series of publications by SOMO and ICN presenting the findings of on-going desk and field research carried out over the past four years. SOMO and ICN and Indian researchers are part of a joint effort to turn international public attention on the deplorable conditions in this industry. The report portrays the situation in the spinning units of five textile and garment enterprises in Tamil Nadu. The mills are part of the supply chains of European and US clothing brands and retailers, as units of vertically integrated Indian companies that engage in the production of ready-made garments. As producers of export quality yarn and fabrics, the mills are also part of the supply chains of many other European or US brands and retailers that source from garment manufacturers in countries such as China and Bangladesh. The corporate profiles of these five mills presented in this report (see Chapter 2) are based on information retrieved from corporate websites complemented with information painstakingly gathered by local researchers. This desk research was supplemented with information from interviews carried out with 151 workers under condition of anonymity. As in previous publications, this report focuses on forms of forced and bonded labour and labour migration within India. Chapters 3 and 4 focus specifically on the exploitative labour practices that women workers have to endure, many of them Dalits (‘outcaste’) and migrants. Child labour is a reality in the mills. Among the workers interviewed for this research, 60 per cent were below the age of 18 when they joined the mill. The youngest workers were 15 years old at time of joining. All the interviewed workers live in hostels that are located on the factory grounds. Staying in the factory hostel is mandatory for workers who come from other districts or villages. Rooms are shared with up to 35 people and facilities are very basic. Toilets and bathrooms are shared by 35 to 45 workers. Freedom of movement is very much restricted at all five investigated mills. Workers are not allowed to leave the hostel on their own. There is hardly any outside contact, which for some workers makes the stay in the hostel very hard as they miss their family and friends. Workers may only contact their parents through the hostel phone. Mobile phones are not allowed and after-work activities are limited. Under the pretext of cultural traditions, girls and women are effectively locked up. Working conditions are harsh. At four of the investigated mills, employees must work for 60 hours a week or more, all year round. Overtime cannot be refused. Night shifts are equally obligatory. Supervisors are relentlessly pressing workers into a fast pace of work. Humiliating disciplinary measures are applied. Workers are only allowed short breaks. Physical conditions at the mills are unpleasant with high humidity, lack of fresh air and cotton dust flowing around. Protective equipment and health and safety training are inadequate in many cases. And to add insult to injury, workers at all five mills are not entitled to paid sick leave. The long hours of work and the hostile, insecure and unhealthy environment, are all taking a severe toll on the workers, whose physical and mental health is negatively affected. One 14-year-old girl working at one of the mills in question reportedly committed suicide in March 2014 (see Box 3) while another young woman aged 17 also reportedly threatened suicide in 2013 because of the hardships she had to endure at work (see Box 8). This report shows that workers rarely sign a contract when taking up employment. Workers do not know what they are signing up to, if they get to sign anything at all. Workers do not get payslips. Without contracts or payslips, they lack real information about the wages and benefits they are entitled to. In four out of the five researched mills, workers get paid in cash, without signing for receipt, and without any supporting documentation or explanation about hours worked or overtime rates. There is no minimum wage for spinning mill workers. Research showed that average monthly salaries ranged from € 20 to € 52 at the five mills. Many of the interviewed workers send most of their money home to support their families and to pay for siblings to go to school. The researched mills recruit workers with the promise of paying them a lump sum amount at the end of their contract. This is tempting to many families who are faced with the prospect of paying a large dowry when their daughters are married. At several mills, workers were told that this lump sum is made up of the contributions made to the Provident Fund (PF). In this report, SOMO and ICN point out the huge danger that workers will not get the lump sum promised to them, since they do not have the PF registration number. In addition, there are indications that employers fail to transfer the required contributions to the Provident Fund (see paragraph 3.3). This amounts to outright wage theft, which is obviously a serious breach of law. The right to associate and to bargain collectively are crucial in guaranteeing protection and respect for workers. The notion of freedom of association is, however, a dead letter for the women workers who were interviewed for this research. It is clear that many of the workers are not well informed about their legal rights under Indian or international law. Trade unions in India face a number of restrictions and obstacles at the stages of formation and registration, as well as in terms of day-to-day activities. Anti-union prejudice is widely prevalent. Employers enjoy a dominant position with no or little countervailing power. Criminalisation, threats against labour activists or striking workers, violence against union members, as well as against NGOs, is common practice. SOMO and ICN found an alarming lack of transparency when researching this report. The market parties, both producers in Tamil Nadu and buyers from all over the world, are not forthcoming with even basic information. There is no such thing as supply chain transparency. On the contrary, there is an alarming lack of openness. Buyers hardly provide any information about where they are sourcing from. Precise information about supplier relations is limited and very hard to come by, which makes it difficult to hold companies to account for violations along their supply chain. Over the past few years, civil society organisations, individual companies, multi-stakeholder initiatives, business initiatives and governmental actors have all undertaken efforts to curb abusive employment and labour practices in Tamil Nadu. As outlined in Chapter 5, there are signs that this has led to some improvements in garmenting units that are directly linked to Western buyers. However, exploitative employment schemes and substandard working conditions remain widespread in the spinning industry. Buyer companies’ monitoring and improvement efforts are generally limited to the units that produce end products. They do not focus on earlier production phases, such as spinning, weaving and dyeing, even if this takes place in units that are part of the same group company that supplies the final product. SOMO and ICN strongly affirm that buyers’ supply chain responsibility extends beyond first-tier suppliers to second and further tiers, including spinning mills. This notion of extended supply chain responsibility is supported by the United Nations Guiding Principles on Business and Human Rights. Chapter 7 offers a set of recommendations for stakeholders ranging from buyers to governments that are urgently needed to help improve the working conditions for girls and young women who are suffering intolerable conditions in the mills of Tamil Nadu in order to satisfy the relentless demand for clothing from big brands around the globe.